The blood of innocents has been spilt, a terrible sequence of events has been set in motion. The forces of darkness are on the move. Deep underground, an army of light prepares itself for the oncoming war. The Doctor’s used to winning. Stumbling in, reading the face of the enemy, and then beating the odds but what if this time he’s got it wrong? Charley and C’rizz think he has. Stripped of all that is familiar, just who is the Doctor? Major Koth thinks he knows. Lost among the dark caverns of an unknown world, has the Doctor finally met his match? Paul McGann is the Doctor in The Twilight Kingdom. The Eighth Doctor’s has a bit of a go, hasn’t he? He wakes up with amnesia, barely defeats the Master to save the Earth, snogs a hot redhead surgeon, hangs around with Mary Shelley, saves an Edwardian Adventuress from her certain demise, encounters the Cybermen, saves the population of a drowning Venice, gets amnesia, prevents an alien invasion of Earth with the assistance of Orson Welles, enjoys plum pudding inside of a time loop, races through time to stop a madman and his alien masters, stumbles through darkness external and internal, encounters the Daleks as they attempt to erase Shakespeare from existence, finds that saving his good friend might cause the entire Web of Time to collapse, gets amnesia, ends up exiled to another universe where he’s forced to merge his body with his companion in order to escape, watches as said companion is turned into an insect for breeding purposes by an alien race, and finds his memories used by a totalitarian society to ferment revolution. 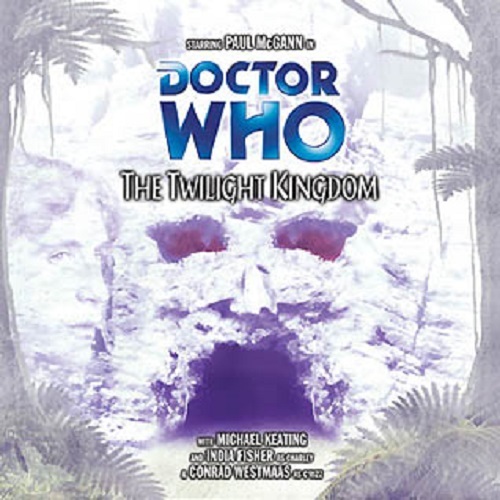 The Twilight Kingdom is the season finale for the “third season” of the Eighth Doctor and also for the “first season” of the Divergent Universe storyline. The Doctor, Charley, and C’rizz find themselves in an underground military installation whose inhabitants are acting very strangely. It’s the type of story that has all of the trappings of classic Who, but it fails to provide any additional details or effort to make the story stand out, moving in a “paint by numbers” fashion that cause the serial to fail as a story and ESPECIALLY fall short as a season finale! Once again, the Doctor and his companions, Charley and C’rizz, find themselves passing through the Interzone with the “permission” of the Kro’ka. Emerging in a lush jungle teeming with life, the trio discover a recently crashed hover-skimmer and its driver…a skeleton, covered in moist soil, that appears to have been dead longer than the wreckage would otherwise indicate. The trio are soon captured; the Doctor and C’rizz by a group of soldiers hunting for one Colonel Koth, leader of a rebellion against the local government, and Charley by a soldier working for Colonel Koth. All converge in an underground cavern which serves as the hidden base for the rebels. As the trio watch, Colonel Koth welcomes his pursuers as new recruits by forcing one of the soldiers who came to capture him to shoot his colleague in cold blood! The Doctor realizes Koth has a mental hold over his followers, and that anyone who is transferred or promoted from the camp is never seen again, but finds himself confused when Charley and C’rizz sympathize with the rebels and demand the Doctor help them! There is obviously more to the rebels and Colonel Koth than meets the eye, but for once, is the Doctor wrong and possibly placing himself on the losing side? This has been a weird cycle for Paul McGann, who’s alternated great performances with a series of lackluster turns. Now, that’s not fair to McGann; it’s a patch on The Twilight Kingdom’s weak script. All four stories for this “second season” were recorded over the course of a week. The Natural History of Fear was the first story to be recorded, and Scherzo was the final tale put to tape. 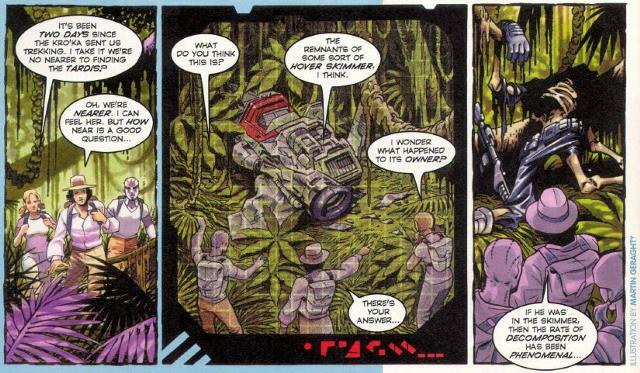 So you can’t blame McGann sleepwalking his way through this one on fatigue. He touches upon the same personal concerns as he did in Scherzo, the lifetimes worth of pain and loneliness, but not with nearly the same pathos. When the Doctor has his typical thoughts and actions, of fighting for his friends, bringing down the regime, conquering evil, McGann just sounds bored. If the script had invested more time in the truth reason why the Doctor was so concerned with saving the day, McGann’s half-hearted performance could have been explained via the plot. Sadly, it’s glossed over, so the Doctor, and McGann, just sounds like he’s going through the motions that the script calls for and giving little effort otherwise. I have to lump Charley and C’rizz together because that’s what Shindler does. After two stories, we finally get a little bit of background about C’rizz; his skin can change color and he prefers a humid climate over a dry one. Plus, he’s never truly held a weapon until he’s met the Doctor, as he was once a priest and a man of peace. Charley, after being stung by a deadly flower and almost losing her arm, finds herself doubting the Doctor and wondering if he truly is the man she fell in love with…until everything is resolved and she reaffirms her love for him. One word – ugh. Once again, Shindler’s script is more concerned with showing THAT Charley and C’rizz doubt and distrust the Doctor as opposed to showing WHY Charley and C’rizz doubt and distrust the Doctor. Considering what happened to Charley in The Creed of the Kromon and how C’rizz hasn’t really has ANY character development up to this point (especially since Charley and C’rizz only had “cameos” in The Natural History of Fear), there’s little done here to advance their characters and that’s an injustice to both the characters and the actors. Their distrust and “betrayal” of the Doctor hits Adric-levels of “oh, come ON” in terms of writing, execution, revelation, and acceptance. If the script doesn’t have any trust in the characters, can you blame India Fisher and Conrad Westmaas for not putting in any trust in the script? Once again, the sound work deserves praise, not only for the lush jungle setting and cramped, mossy conditions of the underground base, but for sounds of moving soil, running water, and the revelation of the creature at the end of the third arc with the sounds of several internal organs in external places! But the sound crew isn’t helped by Gary Russell’s directing. I hadn’t really noticed until now just HOW many Big Finish audios Russell has directed. By the time of The Twilight Kingdom, Gary Russell has directed THIRTY-FOUR out of FIFTY-FIVE released for the monthly range, and is nearly halfway through a run of TWENTY-FIVE consecutive outings as director, going all the way back to Flip-Flop. While there has been a mix of “good” stories and “bad” stories along the way (and will continue to be), The Twilight Kingdom is a story that lends to the idea that Russell needed to take a bit of a break. The players sound bored for nearly the entire story, unless they are showing anger by shouting or tense, harsh words. At times, in conjunction with the script, The Twilight Kingdom sounds more like a cast of actors describing the events of an audio play as opposed to actually being an audio play. There’s no sense of tension or dread, nothing urgent about the Doctor’s seeking of the truth, or a soldier’s curiosity about those who were “promoted” and never seen again. Russell’s shown he could build suspense in plays such as Davros, but that directorial knack isn’t on display here at all. The biggest sin The Twilight Kingdom commits, however, isn’t following up on all the different seeds, or allowing the actors and actresses to build up a sense of mystery and dread. There would be plenty of time for these to occur if the entire play wasn’t so damn padded for running time. The concept of “padding” isn’t unfamiliar to Doctor Who. With four, five, maybe even six episodes per story during the classic era, the episodes had to fit the BBC’s allotted run time of 22/30/45 minutes. Sometimes, there just wasn’t enough story to fill the entire episode, so you had running up and down corridors, the Doctor and companions being captured, escaping, and recaptured, or long takes of the group walking across some sort of landscape. This story has the audio equivalent of padding, as the Doctor and companions are captured, escape, are recaptured, but then allowed to roam the base at will as long as they don’t try to escape. The actors take their time delivering their dialogue, which is excessively wordy and verbose. Arguments go on far longer than they should. Empty threats are made. Scenes and actions are described in detail. The Twilight Kingdom would have been better served as a two or three part story, or a four party with the editor carving out the dead audio weight and replacing it with better dialogue that explained plot points glossed over or forgotten. Almost the entirety of episodes two and three could have been combined into one episode, and a daring editor could have divided that episode up among episodes one and four! In the end, the whole Divergent Universe arc has been a mixed bag, with two really good stories, one really bad story, and a below-average one in The Twilight Kingdom. The Eighth Doctor is my Doctor, but I’m ready to hang out with the other Doctors for a bit and see what they’re up to. Hopefully, by the time we return to the Divergent Universe, the second half of this saga will be better plotted and planned out. Synopsis – Incredibly padded for running time, The Twilight Kingdom closes the book on the first half of the Divergent Universe arc with a weak and boring effort. 2/5. Peter Davison is the Doctor in…The Axis of Insanity. This entry was posted in Big Finish Review and tagged 2/5, Big Finish, Big Finish Review, C'rizz, Charley Pollard, Conrad Westmaas, Doctor Who, Doctor Who Audio, Doctor Who Review, Eighth Doctor, India Fisher, paul mcgann, TARDIS. Bookmark the permalink. I think you are spot on, both in your comments about this story and about the whole Divergent Universe season in general. While I didn’t hate this story, I do think it is incredibly dull and I totally agree with your comment that this story could have been chopped down to two or three episodes without losing much. I look forward to reading your thoughts on the second series of Divergent Universe audios.